Everyone loves &apos;Cash-Back&apos; or &apos;Free-Goodies&apos; for simply buying the stuff that make them go faster, look cooler or helps them while at the track or in the garage. These types of deals don&apos;t come along as often as we would like, so to help our customers save some cash, we update this our Rebate Center each month with all the active brand rebates we can find. Most of these factory promotions are mail-in rebates. For your convenience, we have provided you links to open and print these rebate PDF forms. Sometimes, a manufacturer will provide a dedicated us a link to a &apos;rebate&apos; page on their website. If you have any trouble accessing these rebate documents or website links, please call us or email us as soon as possible so we can help. 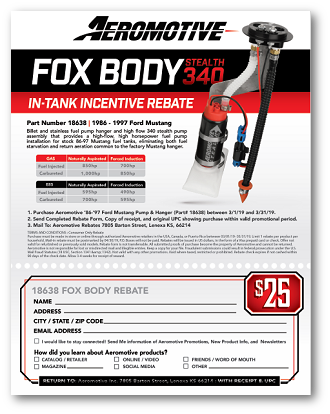 Know of An Active Factory Rebate Promotion That We Are Missing? Please help-out your fellow gear-heads... Simply drop us a message via email and we&apos;ll look into getting your suggestion added A.S.A.P. to help other Racecar Engineering™ customers. So What Are You Waiting For... Go Now and Claim Your Cash Today. Enjoy Your Savings!